Improve your system's performance with the Patriot 4GB Laptop Memory Module. This memory module for laptop is boosted with 4GB of DDR3 memory that offers more responsive system and a smoother workflow. Added with a memory speed of PC3-12800 and 1600MHz, it delivers quick communication with the processor and uninterrupted multitasking. With the SODIMM socket, this module allows to maximize memory bandwidth and minimize performance bottleneck to deliver superior user experience. The 240 pin feature ensures a secure connection with the motherboard. Plus, the CL 11 features offer effective hours of performance. 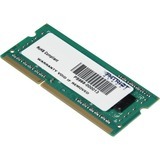 Order the Patriot 4GB Laptop Memory Module today!